The focus of this class taught by Susan Santiago, owner of Galeria San Francisco, teaches the materials and techniques of painting in acrylic. Students learn the basics of handling acrylic paints and brushes and explore a variety of techniques such as glazing, layering, impasto. Students can work with different subject matter such as portraits, landscapes or abstraction. The fundament;as of composition, tone, and blending colors will be covered. 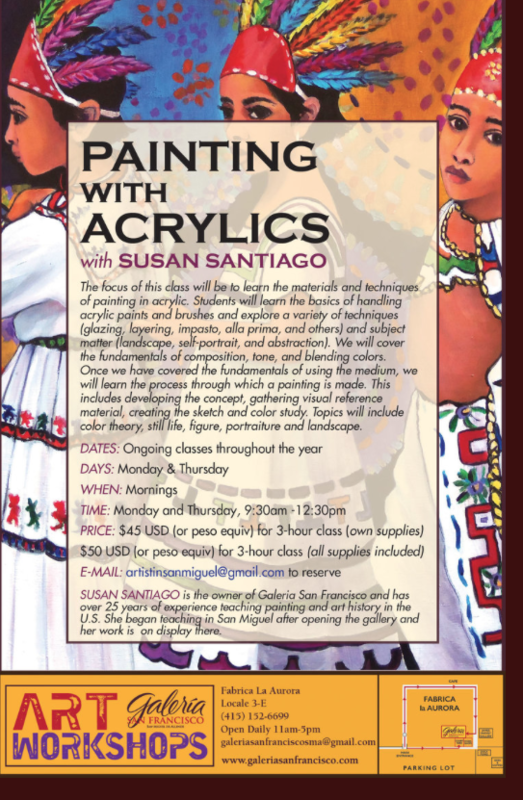 The cost of the class is $50 USD or peso equivalent and include all the materials.